I spend a lot of time sitting at a desk. Some days it is my desk in the osteo-lab at the university and other days it is my desk at home (I live about 1 hour and 15 minutes from my university, don’t you know). 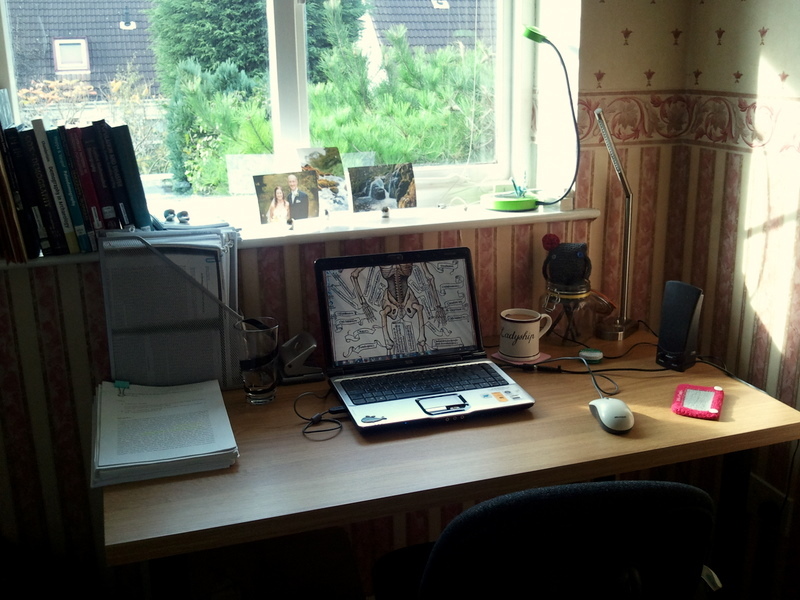 I travel in to the university two to three days a week and the other days I work in my ‘office’ in the back room of our house. I am the kind of person that requires a comfortable working space, otherwise I find that I can never get settled enough to actually pay attention to what I am supposed to be doing, like reading a load of articles or researching the anatomy of an ewok. 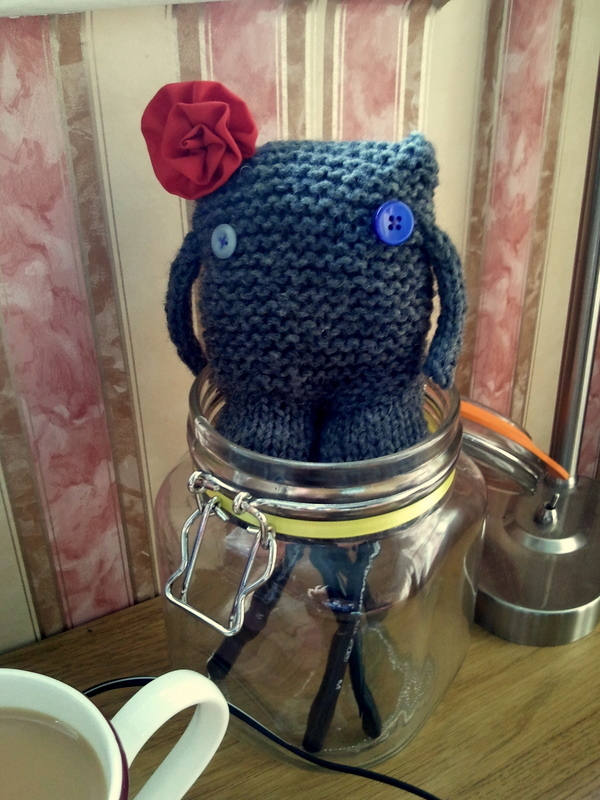 I was given tiny monster as a birthday present by my friend Gillian. I always thought of tiny monster as a boy, but the flower is pretty fetching on him… perhaps he is a bit of a cross-dresser? Now, I am totally not going to big myself and my mad photography skills up here, but I am pretty fond of this photograph. I took this picture at Pistyll Rhaeadr waterfall in Wales when I was on honeymoon (it’s the highest waterfall in Wales and while we both agreed it is no Niagra Falls, it is still pretty fabulous). 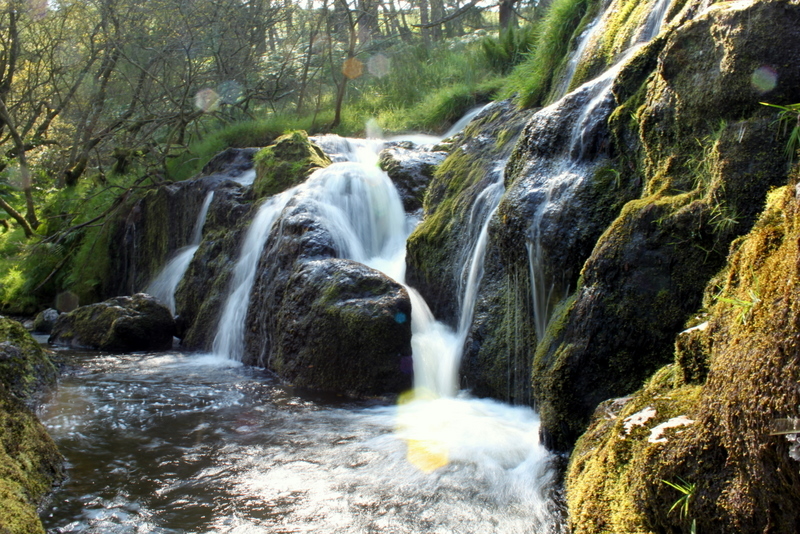 And for you clever people, no, this picture isn’t specifically of Pistyll Rhaeadr, but rather one of the smaller pre-plunge cascades. I clambered like a (poor excuse for a) mountain goat over some threateningly slippery rocks and perched the camera between my knees as I sat on my bum, in an attempt to stablise the camera, as I decided to not use the awesomely designed tripod ‘GorillaPod’ that was made specifically for these situations because I chose to leave it in our cottage that day. I tried a few different shutter-speeds and finally decided on 0.25s, mostly because that is as long as I can hold a camera on my person without moving it and creating a fantastically blurry photo instead of an impressively artistic long-exposure shot. I find photographs of water (rivers, waterfalls, oceans, etc) relaxing, and especially those taken on long-exposure. It gives them a sort of an other-wordly quality, in my mind. I am feeling pretty relaxed right now… now let’s see how well this photograph does in the third year of my PhD at calming my fraying nerves. I am sure someone’s done a study on it.